As a landlord who wants to rent out your property by yourself without giving one-month rental to agent, there are many ways to advertise your property, from the very traditional way of printing it out and stick on the bus stop and phone booth near your property, to a more efficient way of posting it online. We are not going to share on 20th century way here but the online method – website or online marketplace. 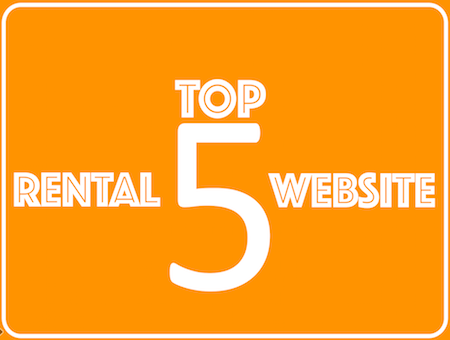 Here are top 5 websites in Malaysia in no particular order that you can list your property. 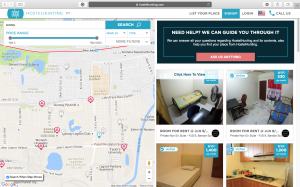 “Bilik” means room in Malay language, as it’s name stated, this is a room rental website. Presence in 5 Asean countries, iBilik is one of the best room rental websites in the region in terms of daily traffic and number of listing by landlords. Besides room rental, it has also short stay rent listing. iBilik offers landlord unlimited posting with one restriction – only one picture for each listing to keep the page clean and clear. You may leave your contact number in the property description, interested tenant may contact you by Whatsapp or phone call for enquiry and viewing, iBilik doesn’t involve anything after listing. I must say one first look Speedrent is very neat and intuitive website. It has very specific features to ease the renting process e.g. standardized e-agreement, easy scheme that lets the tenant pay zero deposit upfront when renting your unit, whereas Speedrent will ensure on-time payment by charging tenant’s credit card and pay to you. Speedrent even guarantees their will keep paying you 2-month rental even the tenant default on payment, however this starts only from 4th month of the lease term with strict terms and conditions. 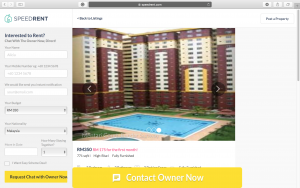 Listing a rent on this platform, landlord must agree to give out 50% off on first month rent to tenant, the idea is passing half of the saving that supposed to be given to agent to tenant instead. Best option for landlords who have property near university or college, student and young working adult are the targeted group. They offer concierge service that handles everything from photo shooting, enquiry to booking, so absolutely hassle free, however landlord needs to pay 50% of the first month rent as service fee. Search options are excellent, you may search by your school, and view the available rent on a radius of your school on map. When the unit is clicked on, the map counts the distance from that unit to school, cool isn’t it? A classified marketplace like Craiglist, you can advertise anything that includes property rent. You may post up to 6 listing for free, more than that you need to pay. If you wish your listing standouts to rent faster, you may use Mudah Premium Service like Bump Ad, Featured Ad and Urgent that cost less than RM 64/month/listing. hi .. there is another one. Yes. We are having a house for rent and its allow pets to stay in the house provided that keep the environment clean.